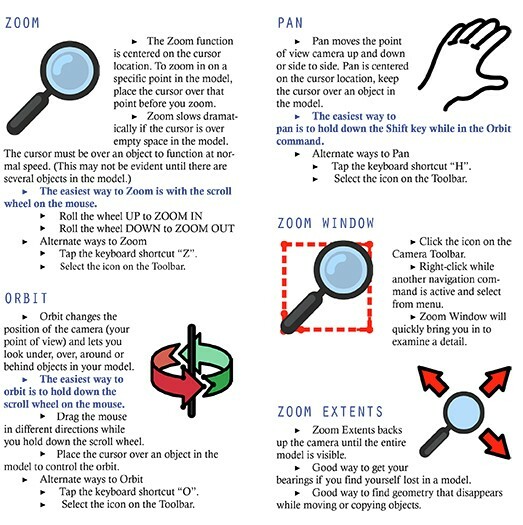 Download a free excerpt from the “New Woodworker’s Guide to SketchUp” about navigation. A few years ago my son talked me into playing a video game, one where we had to run around an imaginary world with people shooting at us. I sucked at it, big time. I got blasted before I could figure out which way to run and every time I tried to duck I jumped instead. I should have practiced how to navigate this 3D world before the shooting started. My frustration led me to give up before we got to the fun part. I remember this episode every time I teach a SketchUp class, because I see the same frustration in my students. Before we begin to try to make anything, we spend some time learning how to get around. If you’re trying to teach yourself how to use SketchUp, navigation is a real problem. The Zoom, Orbit and Pan commands in SketchUp don’t behave the same way in an empty model as they do when there is some stuff in it. It’s a classic “Catch 22”. You can’t make anything until you learn how to navigate, and you can’t learn to navigate until you make something. Click on the 3D Warehouse logo in the bottom right corner of the image to download the model. You can do that from your browser, or you can do it directly from SketchUp. Start a new SketchUp file, click on the File menu and select 3D Warehouse/Get Models. When you’re in the warehouse, search for “Bob Lang’s Navigation Practice”. You can load the model directly into your SketchUp file. When it arrives, you’ll see several objects surrounded by blue lines. Click on the axis origin (where the red, green and blue lines meet) to let these objects go, then put the cursor over one of the objects, right-click and select “Explode” from the menu. Now you can zoom, orbit and pan to see what these things are made of. Because of the importance of navigation, my book “New Woodworker’s Guide to SketchUp” begins with a review of getting around in SketchUp. Included in the book are a couple of pages of notes on navigation, and a short video. The video is embedded below for you to watch online, or you can download a 2-page PDF excerpt (which includes the video) and open that with Adobe Acrobat Reader. You can open the PDF in a browser plug-in, or other PDF programs, but the video won’t work unless you’re in Acrobat Reader. help in small bits to understand how to use it.